With this setting, the title is applied. With this setting, the symbol settings are applied. With this setting, the display settings are applied. Applies the link destination settings. 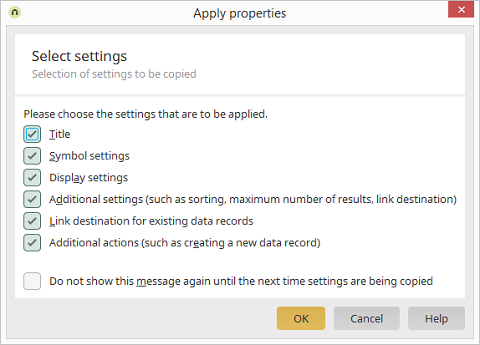 With this setting, this dialog will not be shown when the copied settings are applied to other Relationship elements via Edit menu / Apply properties. The dialog will not be shown until you copy properties from an element once more.